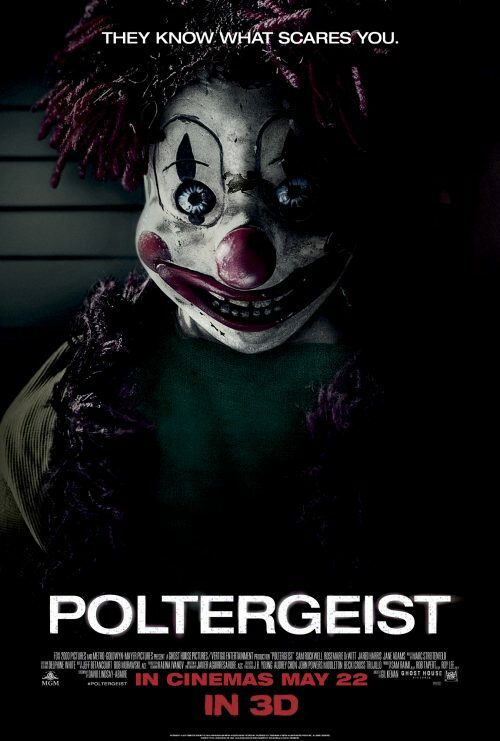 The remake of the classic 1980s horror film, Poltergeist, has just had a new poster released. It’s one of the scariest posters I’ve ever seen. It maybe just down to the subject matter! We have seen that toy before in the previous poster. This time it gets its own poster all to itself. I’m not sure what it’s meant to say about the film. Is this the evil poltergeist in living form? If that’s the case then it’s not going to be a remake but more of a based on a classic film sort of one! This is another film that has been made, not because it’s going to be a great film but more likely that Hollywood has lost its way and not taking risks anymore. It’s easier to remake a classic film than come up with a new idea and risk money making it. Legendary filmmaker Sam Raimi and director Gil Kenan contemporise the classic tale about a family whose suburban home is haunted by evil forces. When the terrifying apparitions escalate their attacks and hold the youngest daughter captive, the family must come together to rescue her before she disappears forever.